The number 13 gets a bad rap. Just ask every hotel ever in the country ever. While 13 can be a favorite number of a lot of people, or a terrible excuse of a nickname for Paul George, most people associate the first number in the teens as unlucky. But in fantasy football you need Week 13 to be anything but unlucky – you’re either fighting for playoff positioning or in a first-round matchup. 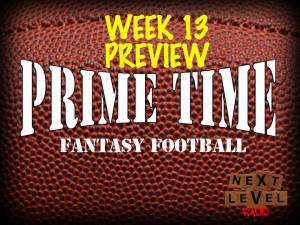 That why Prime Time Fantasy Football has become more vital than ever, so listen up! This week Adam and I will discuss all 16 games going on in the NFL, all for you. Topics will include how to deal with the Cardinals’ injuries, what to do with the Broncos’ running backs, and where to go with T.Y. Hilton. We also get to listener questions, which include some FLEX advice and roster advice heading into an important matchup. Last week was all about the turkeys. This week the only turkeys are Adam and myself, so we’re back to Show Me The Money and the Fantasy Fact of the Week. We close the show with that.